He played a central role in the New Labour project which saw the party move into the centre ground and sweep into power with a vast majority in the 1997 election. 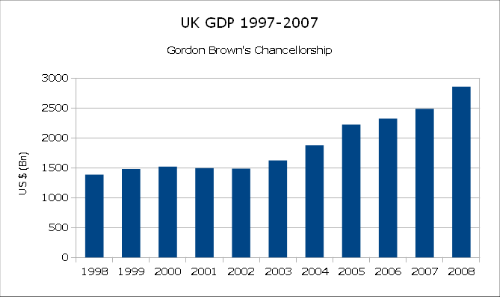 Mr Brown presided over a decade of growth as Chancellor between 1997 to 2007 and before occupying Number 10 from 2007 to 2010, when he lost the general election to Mr Cameron. Supporters are likely to see Mr Brown’s implementation of the minimum wage, opposition to adopting the Euro, global leadership during the financial crash of 2008 and influential role in keeping the Union together as proof of his impressive political legacy. Critics will point to his maneuvering against Tony Blair, ending “boom and bust” claims, failure to act earlier to minimse Britain’s recent recession and ultimate lack of victory at a national election as leader as proof that he never lived up to his political potential. I remember the first time I saw him, he was speaking to a civil service trade union rally during one of their pay disputes, and I remember thinking and hoping he’d go far. On the election of Blair’s Government, I didn’t expect them to deliver 10 years of growth. In fact I was so certain it wouldn’t that I put large elements of my pension savings abroad in the USA and Pacific Rim. Boy that was a mistake! But after years of plotting, including ensuring that there was no other succession plan nor feasible candidates he finally succeeded Blair and became Prime Minister just in time for the global economy to hit a brick wall. The western world turned to him, and in Britain the response to the crisis was to guarantee the Banks, “to do what it takes”, to nationalise (with regret) the failed banks and to increase macro-economic demand. These plans have been ignored and reversed by the Tories since 2010. Brown’s final election campaign was damaged by Sky’s campaign to run “Presidential Debates”, in which he performed poorly but to those who heard it, he redeemed his poor performance as both a campaigner and Party leader with this speech to Citizens UK restating his Social Democratic manifesto, he was one of the few to be able and willing to do so. It’s a shame he didn’t make it on becoming Prime Minister; it might have been a beacon by which he could have measured the actions of the next three years. The fact is that many, maybe even most, by 2007 expected Brown’s Government to be different from Blair and New Labour. Against the expectations of many of his long term supporters, he didn’t have a plan, he was the third wheel on New Labour’s Project, ultimately disappointing those who thought he was different from Blair, and those who hoped he would be. Like Cameron, it seems he just wanted the job. After the election, he sought to become the Managing Director of the IMF, a job that his record as Chancellor, Prime Minister and Chairman of the G7 would have suited him. He failed to get UK support; the Tory Government couldn’t admit that his strategies of nationalisation and Keynesian reflationary demand management were part of the answer, nor that the problem was global. He resigned as Labour Leader after the 2010 election and has had a quiet Parliament publishing several books and campaigning against African poverty and taking on the role of UN Envoy for Global Education and working for various charities; this time will be best remembered for his speech during the Scotland Independence Referendum. It was a major and highly political intervention. He provided the hope and vision that many claim the No campaign missed. He argued that the UK was the oldest, longest lived and most successful example of pooled sovereignty and that it was worth keeping and developing. It raised the No arguments beyond currency and economic fear and created a positive ideology of voting to stay with the Union. The speech was also entwined with promises of positive changes to the devolution settlement together with a schedule which required that the new proposals were substantive in time for the general election. It is considered that he delayed his announcement of his decision not to stand for re-election as part of his stewardship of his Devo-Max proposals but he delayed until two and half weeks before the ‘long campaign’, after Labour’s NEC have suspended local party short-listing and 18 months after the deadline set by the Labour Party NEC. While the reasons for delay can be understood, the membership of Kirkaldy & Cowdenbeath Labour Party might not thank him. The Guardian in their reportage took an interesting line, chronicling his achievements and failures but suggesting that his record is less blemished than Blair’s and I might add Cameron’s and history will remember him well. This is another article that got away from me and took too long to write. It has been backdated. Image Credits: Both pictures are from wikipedia, the featured picture is public domain, the Northern Rock picture inline, is CC BY-SA 2.0 2007.